SEVIERVILLE, TN – The iconic and profoundly influential Nitty Gritty Dirt Band will headline Sevierville’s 15th Annual Bloomin’ BBQ & Bluegrass festival. The band is often cited as a catalyst for an entire movement in Country Rock and American Roots Music. 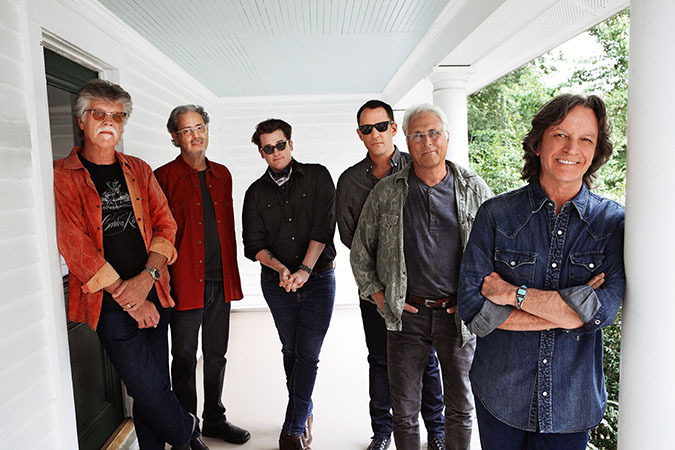 Nitty Gritty Dirt Band will take the stage at Bloomin’ BBQ & Bluegrass on Saturday, May 18, 2019 beginning at 8pm. The band has toured non-stop for 53 years and racked up multi-platinum and gold records, strings of top ten hits such as “Fishin’ in the Dark” and “Mr. Bojangles”, and multiple GRAMMY, IBMA, and CMA awards. The band is perhaps best known for their groundbreaking “Will the Circle Be Unbroken” album. Released in 1972, the three-LP set featured collaborations with bluegrass and country music legends including Roy Acuff, “Mother” Maybelle Carter, Doc Watson, Earl Scruggs, Merle Travis, Jimmy Martin, and many others. The album bridged cultural gaps by introducing a whole new generation to earlier styles of music. The Bloomin’ BBQ & Bluegrass festival runs from 5pm until 10pm on Friday, May 17, 2019 and from 9am until 10pm on Saturday, May 18, 2019. The festival features a full lineup of bluegrass entertainment on the main stage. Friday’s musical entertainment begins at 5pm with a live performance from Priscilla & Little RicKee featuring special guest and multi-award-winning songwriter Louisa Branscomb. At 6pm Jimbo Whaley & Greenbrier take the stage followed by 11-time IBMA fiddle player of the year Michael Cleveland & Flamekeeper at 7pm. Two-time IBMA Entertainer of the Year Balsam Range headlines Friday evening’s performances beginning at 8pm. Since forming in 2007, Balsam Range has garnered 13 IBMA awards, released 8 critically acclaimed albums, and headlined major festivals coast-to-coast. Their current album, Aeonic, is available now. Saturday’s main stage line up begins at 2pm as five-time IBMA female vocalist of the year Dale Ann Bradley takes the stage for the first of two sets (at 2pm and 5pm). Love Canon performs their acoustic take on electronic-tinged pop hits of the ‘80s and ‘90s live at 3pm and 6pm. Phil Leadbetter and the All-Stars of Bluegrass are on stage at 4pm and 7pm. Nitty Gritty Dirt Band closes out the festival at 8pm. In addition to great music, Sevierville’s Bloomin’ BBQ & Bluegrass festival also features 40 of the nation’s top BBQ cook teams, artists and crafters, kids’ games, a vocal competition honoring the songwriting of Dolly Parton, a late-night Bluegrass Jam, and a People’s Choice BBQ Tasting event. Admission to Bloomin’ BBQ & Bluegrass and the concerts are free thanks to great sponsors, including the Sevierville Chamber of Commerce which encourages you to stay in Sevierville while visiting Bloomin’ BBQ & Bluegrass.